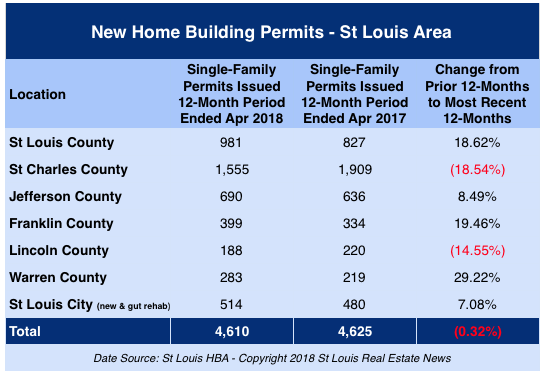 As the table below shows, for the most recent 12-months that new home building permit data is available for from the Home Builders Association of St Louis & Eastern Missouri, there have been 4,610 new home building permits issued in the 7 counties they report on. This is just slightly less than was issued for the prior 12-month period ending April 2017, when there were 4,625 permits issued. There were 1,555 new home permits issued in St Charles County in the most recent 12-month period, a decline of 18.54% from the prior 12-month period. Year to date through April, there have been 447 new home building permits issued in St Charles County, a decline of 27% from the same time last year and a 35.2% decline from the same time in 2016. The overall real estate market in St Charles County is doing pretty well with 6,013 homes sold during the 12-month period ended April 30, 2018. That is a 2.5% decline from the prior 12 month period but still shows the demand is there meaning that decline in new home building permits is most likely not market driven but perhaps more related to lack of available ground. The three counties of St Louis, Warren, and Jefferson had a cumulative increase in new home permits during the most recent 12-month period of 283, making up 80% of St Charles County’s loss of 354 permits during the period and helping to balance out the overall St Louis new home market for the period.